Sometimes pet snakes escape. When they do their owners typically call us to let us know. If you have lost your snake please let us know and we will keep an eye out for it. You will need to have photographic proof as well as your paperwork including perimt and proof of purchase. A lost Black Headed Python in Kurana Downs! 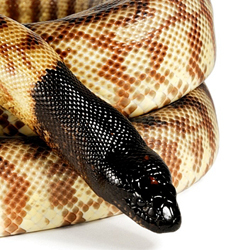 FOUND AND RETURNED TO OWNER - A Black Headed Python has been reported missing in Kurana Downs. If you see this snake please let us know and we will endeavour to return it to it's owner. Please take a photo if possible however, even though this snake is non venomous please take care when trying to take a photo just in case you have mistaken it's identity for a venomous variety.